If you’re a recent college graduate, congratulations! Hopefully you have found a job you love and are working hard to pay off your student loans. However, statistics show a whopping 44 percent of 2010 college graduates hadn’t held even one job by the following spring. According to the Workforce Development Center at Rutgers University, those lucky enough to find a job had a median starting salary of $27,000, a decrease of 10 percent from 2008. So why bother going to a four-year college at all? Good question. The U.S. Department of Labor reported that less than 45 percent of graduates under age 25 were in jobs that required a four-year degree. Where were the rest working? According to The New York Times, many are working in the food and beverage industry. While the Lowcountry may be populated with more restaurants than you can count, there are other options for both college graduates and those who are on the fence about embarking on the journey to a degree. In as little as six months, anyone 18 years or older with a high school diploma or GED can qualify to become a licensed massage therapist in South Carolina. The U.S. Bureau of Labor Statistics reported the median wage in 2010 as $34,900, higher than the median wage of all U.S. occupations. If you think Americans are cutting back on massage therapy during these difficult economic times, think again. Employment of massage therapists is expected to grow by 20 percent over the next eight years. The demand for massage services will lead to more job opportunities as health-conscious baby boomers are looking for drug-free alternatives for the aches and pains that come with aging. 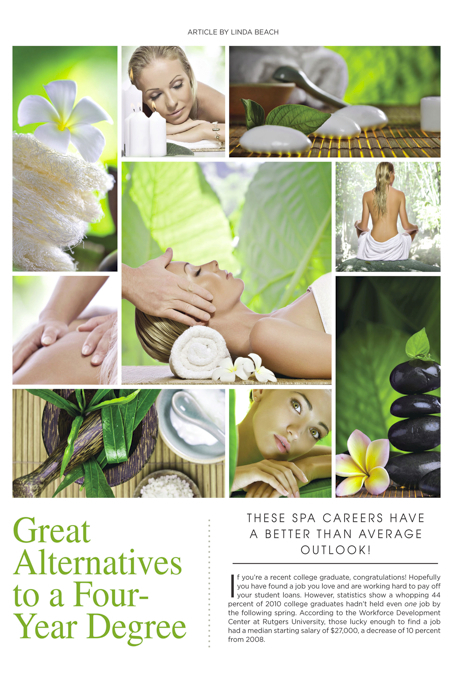 During the recent recession, spas experienced a decline in the demand for luxury services. As with other industries, spa owners had to think outside the box and redesign menu offerings to focus on wellness instead of pampering. This astute marketing effort resulted in an increased awareness of the many benefits of massage therapy and a variety of new job opportunities in the field. Well over half of the massage therapists working in the U.S. are self-employed, allowing them the flexibility to work full- or part-time and set their own schedules. This is especially appealing to women with children in school, as they can work mornings and enjoy afternoons and weekends with family. A career in massage therapy typically appeals to men and women who have a strong desire to help others or who have found pain relief or rehabilitation from an injury through massage. Massage clinic franchises are popping up from coast to coast, offering affordable massages to a wide range of customers and, therefore, employment opportunities for therapists that often include salary, tips and benefits. However, while some resort spas and day spas are able to offer benefits such as vacation pay or health insurance, most will consider their massage staff independent contractors. There are many areas of specialty within the massage field, including the growing need for geriatric therapists and those specializing in sports injuries. Other therapists are capitalizing on the corporate trend of providing chair massage to employees as part of a company’s wellness program. Currently, 44 states require massage therapists to obtain a license in order to practice. Licensing increases credibility in the eyes of the public and cultivates a better understanding of the many benefits of massage therapy. Although there is not a national standard (licensing requirements vary from state to state), most states will allow a practitioner to transfer his or her license if the educational requirements are similar, making massage therapy an exceptionally portable career. If you’ve always fancied yourself a “girly girl,” a career as a skincare specialist or esthetician might be exactly what you’re looking for. Estheticians evaluate the condition of the skin and offer facials, waxing and makeup services. Many states allow skincare specialists to administer body wraps, scrubs, laser treatments and spray tanning, adding versatility to any spa position. According to the U.S. Bureau of Labor Statistics, the job outlook for estheticians is extremely promising, with an expected growth rate of a whopping 38 percent between 2008 and 2018. With over 75 million baby boomers, there is a rising demand for anti-aging skin treatments and cosmetic procedures. While dermatologists and plastic surgeons fueled the initial flood of medical spas, today you will find general practitioners and even dentists adding spa services. While most states allocate Botox and injectable fillers to physicians, estheticians are essential to deliver the myriad skincare services that savvy consumers now demand. Estheticians earned an average annual salary of more than $32,000 in 2010 and the top-paying employers were doctors. Every state except Connecticut requires licensure, but the length of schooling varies widely. The South Carolina Board of Cosmetology requires 450 hours of training; North Carolina checks in at 600 hours; Florida only expects 260 hours and Georgia demands a whopping 1,000 hours! Esthetics training can be commenced after 10th grade and at only 16 years of age, making it a popular first career for perceptive young women. Nevertheless, women seeking a career change at any age are finding the skin care field appealing with the more mature and committed applicants obtaining the highest paying positions. -Is the school licensed by the proper authorities for the programs it offers? Massage therapy schools in South Carolina fall under the jurisdiction of the Commission on Higher Education and skincare schools are regulated by the Board of Cosmetology. If the school is located in a different state, will you be able to obtain a license in the state in which you reside? -How long will it take you to complete the course, become licensed and begin working in your new career? -How much does it cost and what are the available financing options? -How much of the program is hands-on and how much is lecture? How much homework can you expect? Are there out-of-class requirements? -What is the school’s pass rate for licensing exams? What percentage of graduates finds work in the field right away? -Does the school offer job placement assistance? Do they include business classes in their curriculum? -What is the school’s reputation in the community? Will they put you in touch with graduates so you can discuss their experience and success in the field? -What kind of training and experience do the instructors have? Are they currently working in the industry? -Does the school offer continuing education and advanced training classes? Do they stay current with industry trends and offer specialty training? Whether your desire is to work in a team environment or own your own business, the spa industry offers more opportunities than you can count. Massage therapists work with chiropractors, neurologists, psychologists and dentists, as well as in hospital settings, rehabilitation centers and in private clinics. Estheticians work in the professional offices of dermatologists and plastic surgeons, for large cosmetic companies and as makeup artists to the stars. Both licensees can find positions in resorts, spas, salons, day spas, medical spas, and on luxury cruise ships. Take a good look at where you are right now and ask yourself one question: At the end of the day, don’t you deserve to come home from a job you love? 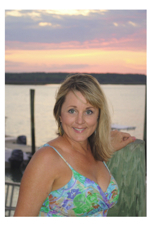 Linda Beach is the founder of the International Spa Institute, a training facility for massage therapists and estheticians, located in Bluffton, SC. Her newest venture, Island Bliss Mobile Spa, brings spa services and ahh-inspiring classes to residents and visitors of the Lowcountry. Linda has been a freelance writer, continuing education provider and instructor of massage and spa techniques since 1993. To find out more about a career in the spa industry, contact Beach at lbeach@isiSPAeducation.com or (843) 259-AHHH (2444). Interesting, informative, and well written article.